What is the last Incubator module you completed? In May of 2017, I was honored to be selected as one of twelve “Real Life Woman Superheroes” by Studio Movie Grill for a red carpet early screening of Warner Bros Pictures Wonder Woman and presented the “Opening Hearts and Minds” award. From over 700 nominations, we were selected based upon our dedication to helping others, resiliency in the face of tough circumstances, and professional achievements. We were invited on a whirlwind two day complimentary trip flown to Dallas, TX. We stayed at the Omni Dallas and honored at a meet and greet luncheon with the executives including the CEO of Studio Movie Grill. I had the opportunity to meet all the other women selected across the country who were also doing great work. Each of us had our own niche and area of need we focused on in serving others. It was an amazing opportunity. To this day, my two sons associate me with Wonder Woman and any time they see the logo or merchandise, they say to me “look momma, that’s you!” and personally, that makes me proud. I’ve been serving the community for 15 years at various nonprofits in the Houston area supporting vulnerable populations. With each job move, came a promotion with higher levels of responsibility. In each of my roles, I always worked hard to earn the trust of my colleagues, community partners, and clients. I always strive for excellence and to exceed expectations. Two years ago, I was unknowingly nominated by my peers to Co-Chair the Women Veterans Empowerment Expo, a committee I had been actively engaged in for the previous two years. This was my first step into leadership. I was scared and questioned my abilities to lead a dynamic group of women to accomplish the goal of planning and executing a one day educational event. Women mentors helped me overcome those fears and to accept the nomination to lead. Our event continues to grow and be successful. Thereafter, more opportunities were presented and I found it easier to be willing to step up to the plate and lead. I am now also a Platoon Leader for The Mission Continues, leading over 300+ volunteers in executing service projects. At work, I also lead a team of social science interns in providing them the professional experience and educating them to become the next generation of social service professionals to serve the community. Today, I find myself ready to pass on the torch of my some of my current leadership roles and to move into the next steps of leadership, school board trustee. “Be the change you wish to see in the world” a quote that I have used as I move through life in deciding the academic degrees I pursued, career choices I have made, employers that I have joined, job opportunities that I have engaged, projects I worked on, committees I participated in, and leadership roles I accepted. It has always been about aligning my skill set, experience, perspective, knowledge with the personal desire for change and impact in that area. I am running for Deer Park ISD School Board Trustee because I want greater diversity on the board that is reflective of the community and the school district. The Incubator has provided me practical skills I need to run and hold elected office. It also provided me the clarity of understanding my sense of duty to become more politically engaged. I am on the ballot! I am running for Deer Park ISD School Board Trustee, Position 3. I am actively campaigning and fundraising. I attend school board meetings, mentoring, political, and professional networking opportunities. I am creating awareness of my campaign to my community. I am door knocking, writing postcards, making phone calls, and advertising. My election is May 5, 2018. Tell us about your favorite She Should Run “aha” moment or success story. In April 2017, I was selected to participate in Women Leadership Summit through The Mission Continues in San Francisco, CA. Unrelated, I had already been considering a run for office for several months but I was at a sticking point. Surprisingly, the summit included an in-person workshop with Erin Loos Cutraro, CEO & Founder, and Sofia Pereira, Community Manager, of She Should Run. The session was great but the “aha” moment would come after it was over. I stayed behind to get pictures but to also discuss my sticking point with them to hear their perspective. The two women listened to me as I revealed my internal conflict and understood my challenges. They provided me the words, encouragement, and motivation to help me move past it and see it in a different perspective. I am very thankful for the opportunity to have met them and to have had that candid conversation which was a pinnacle point in continuing to decide to run for elected office. Why are you an Incubator member? 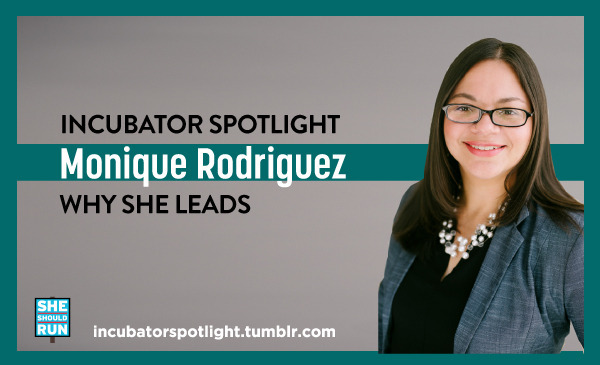 I joined the She Should Run Incubator on November 14, 2016, six days after the Presidential election that would change us all. Since then, I have found such a supportive, encouraging, and motivating group of individuals who whole-heartingly want each other to succeed. The environment and culture of the group keeps me motivated and encouraged. For me, I have a husband and two young sons along with my career to manage while campaigning. It is tough but keeping an updated calendar is essential but while also staying flexible because sometimes things out of our control happen and you have to be ready to adjust and move forward. Prioritizing events and activities which are of the greatest benefit to your goals is also a key to your sanity. For me, I try to keep my job responsibilities at work and during the day. I ensure that I have family time during the weekends and I am at home for my boys’ bedtime at least 2-3 night during the weekdays. I spend time on my campaign on the weeknights and weekends. I try to get good quality sleep most nights to ensure I am ready for the next day. In the evenings, I try to disengage and wind down by reading. As a licensed social worker, I also have to remind myself, “you can not pour from an empty cup” so taking care of myself is essential to ensure I am not empty. It is a juggling act but it is possible.